As part of the “Historical Postal Vehicles” series, a rural postal vehicle drawn by a single horse of the type used to deliver post in the countryside is being presented. 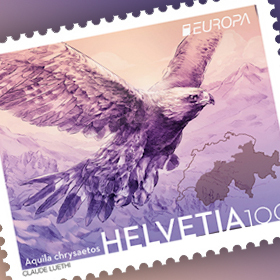 The stamp design is based on a lithograph by A. Fachini. a total weight of 110 kilogrammes was to be undertaken using a single horse, and, of course, the weight of the postillion was not included in this. The driver of the postal vehicle is dressed in a postillion’s uniform which had existed since 1838. He is wearing the “gala uniform”: a red jacket, light coloured leather trousers, black boots and a black bicorne hat. The post horn is slung over his shoulder on a lanyard. There was also a less ornate uniform intended for everyday service, made from a dark grey material with red cuffs and silver trim, worn with trousers reinforced with leather. 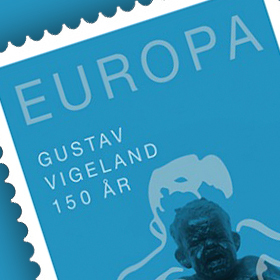 On the stamp design it can clearly be seen that the postillion has a pipe in his mouth, although there were strict regulations about this. So, for example, if there were passengers present, the postal worker was only allowed to smoke with their express permission. The rough design of the vehicle is clearly recognisable on the block of stamps. A journey on such a simple postal vehicle was undoubtedly a bumpy affair, and with only one horse to draw it, it was probably none too quick.